I slept the night through only to wake up early am and ping Mr. R on BB, who told me that there was no Internet! That’s a good sign methinks- I’m sure we can all live without the internet! Surprisingly blackberry and iPhone networks were still strong.. Midnight in Newport sounded eerie- was pitch black and dead silence. Well……. for starters living on the 36th floor of a high rise seems a good option up until now..Water levels rose 4 feet high- my only thought being- what if the boys had leased the apartment they initially wanted- on the ground floor- they would’ve been submerged. Added to that, when Mr. R went down for a smoke in the afternoon, there were hordes of people taking pictures of the wind.. Me- I wouldn’t even want to venture out! I’ve been following friend’s posts on Facebook, and a friend mentioned that a couple of individuals were electrocuted on the street due to Halloween lights- Now you tell me how stupid is that? I mean you know that this is the worst storm to have hit the US ever- why wont you take precaution? Another classic case was that of a guy driving a car, the water was up to his windows and the car swayed dangerously- that’s when he abandoned the car. Like mister- had I met you I would’ve given you a piece of my mind.. You be glad you are out alive. Compare that to the rains that lashed out in Bombay-India years ago.. 26th July is a date every Mumbaite will remember. Anyway- my brother’s acquaintances were in a car, water levels rose, they couldn’t get out and finally suffocated to death. That’s how scary it is.. And you New Yorkers are supposed to be smart………..
Half of NY and Jersey are without lights. Luckily for my bro and Mr R t hey have electricity- The building next door my bro lived there when I last went ot NY) is without lights. I would go crazy! I just hope everything is fine in the country. Though NY and NJ were not in the direct path of the storm- they were on the side of the storm and it was so bad- what with the subway stations flooded and people having lost their lives…… I wonder how bad it is in other places in the East Coast. Well I’m sure I don’t have to tell you stuff- everyone is following up online and on the news…. I however just messaged Mr. R to check if he was ok- I am going to get yelled at soon- if I wake him once more.. Oh well- All is fair in Love- even not letting your spouse sleep cuz you want to know what is happening!!! 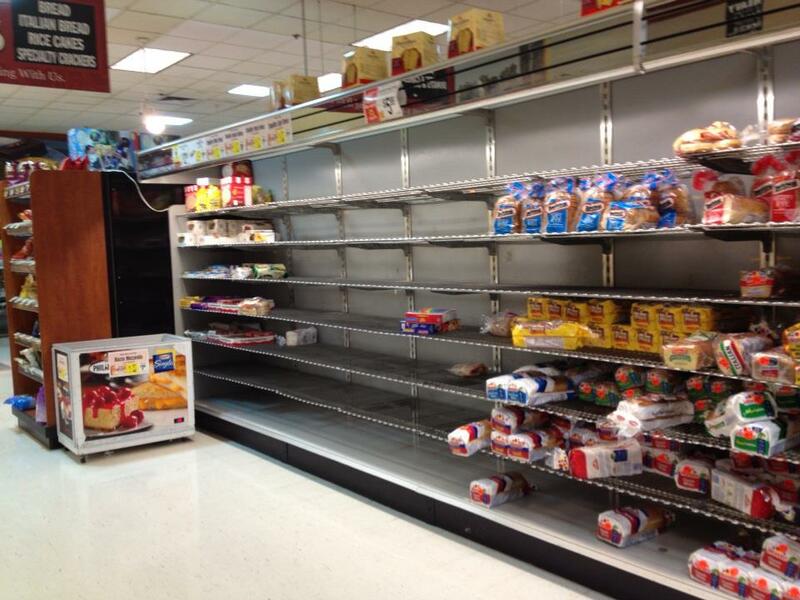 Oh and the pic- I took it off a friend’s wall- see how shelves were emptied before the storm……. Previous Sandy I already dislike you……. Next Never failing November Rain! What a frightening experience! I’m glad you’re safe and sound.